Demerera – the word alone is intoxicating… and once tasted, how can one get along without that deep flavor? Dark and rich, redolent of molasses, leather, cocoa, dark fruits and burnt sugar. So it is – at least for me – and I believe I`m not the only one… Demerara rum really does have a deep flavor that is all of its own. 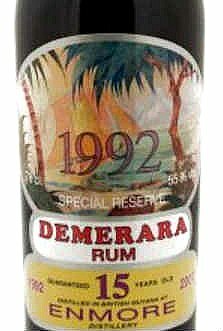 Demerara rum comes from Guyana, its made on the banks of the Demerara river in Guyana and ALL Demerara rum comes from there regardless of where it may be aged and bottled. Its made from sugarcane grown on the coast of the county of demerara, along the river banks and is distilled by the Demerara Disitllers Limited, the DDL. The DDL warehouse in Diamond can store up to a million and half bottles of rum. From the beginning there were several sugar plantations in Guyana which was a pristine land inhabited by Arawaks and Caribs. In 1498 Columbus came ashore – it was at the time when he recently had introduced sugarcane from the Canary Islands into the Caribbean. Sugar was not produced on a large scale until the late 1700s, about 100 years later than in the rest of the Caribbean region, but because the plantation owners in Guyana entered the sugar industry late, they were able to import relatively advanced equipment for milling sugarcane. The sugarcane was brought along sometimes in the 1640s when the early Dutch settlers came. The distilling wasn´t going to be introduced until later in the 1650s and then by the Brittish. This was very important because that´s what laid the foundation of the demerara rum production ending up with every sugar estate having their own still. And by the 1700s over 300 sugar estates produced their own rums – over 300 estates! In 1732 the Port Morant Estate distillery was established and its one of the oldest in the world. This distillery produced a rum of extra depth and character coming from the double wooden pot still – and the navy rum of the past was being produced there. Also a third settlement was established – on the banks of the Demerara river in 1752 and it was called Demerara. In 1814 the three colonies were handed over to the brittish and so they became the Brittish Guyana in 1831. And a few years later – in 1834 – slavery was finally abolished and therefore plantation workers were now imported from Europe, China and India. The rum that was being made and used was colonial rum of Brittish blending and the first OVD (Old Vatted Demerara) rums were made with Guyanese Port Morant as the major component. But at the 2nd half of the 1800th century the sugar estates were closing – only 180 did remain and the wooden coffey still was installed at the Enmore Estate distillery in the year 1880. There were 230 operating sugar plantations in the 1930s and in the 1958 only 18. Those of the estates which lacked efficiency and effectiveness of operations were forced into consolidation. One estate stood out and that was Versailles which eventually absorbed some of the smaller sugar estates and eventually united with Plantation Schoon Ord (south of Goed Fortuin) in the early 1950s, after which it came to be known as Pln. Versailles & Schoon Ord Estate Ltd. Versailles was permanently closed in 1977. Each estate produced its own distinctive rum and the rums were given their own marks (marque) to identify its origin, for example PM is Port Morant. There`s also for example Enmore (EHP) Skeldon (SWR) Uitvlught (ICBU) Albion (AN) La Bonne Intention (LBI) Versailles (VSG) Blairmont and Rose Hall. These are or were sugar estates, not stills – the stills that used to be there are now all, or if not all at least most of them, moved to Diamond. 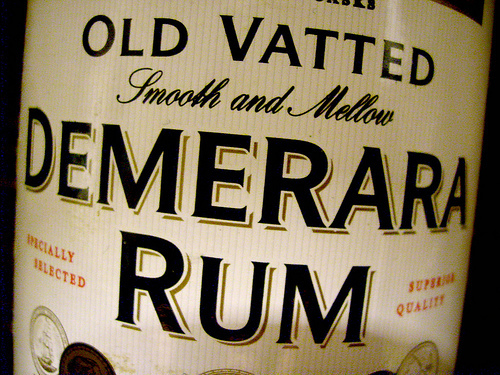 These rums were shipped to England and the trading name Demerara Rum was established. During the early 20th century all the stills were merged and they ended up finally by the DDL – Demerara Distillers Limited. They now are today in the last remaining estate – Diamond – on the east bank of the Demerara river. The wooden continous coffey still – EHP – is the last one left since 1880 and the only wooden column still in the world. It was first at the Enmore Sugar Estate. Made of a Guyanese wood called Greenheart wood. It produces a mild and fruity medium bodied rum (but of course it`s not just the still responsable for a rums flavor) The EHP single barrel rum from El Dorado comes from this still. EHP stands for Edward Henry Porter – the owner of the Enmore Sugar Estate in the 1800s. There are two wooden pot stills – one is single and one is a double. These are 250 years old and originally used to produce the demerara navy rums in the past. These two stills are today often referred to as the Demerara Vat Stills. Old time Demerara navy rum! imagine that! maybe they were much rougher than today but who knows? in any case surely full of personality! if I could time travel i would like to go back to that time and taste the rums they had. The double wooden pot still – used to be in Port Morant Estate that was founded in 1732. A wooden still with a copper neck which was moved to Uitvlught – (pronounced “outflut”) and then in the year 2000 finally moved to Diamond where it is today. The El Dorado PM Marque Single Barrel Rum is a single distillate from the double wooden pot still from the old Port Morant Estate and there`s a good review to read here. This is used in the blends for El Dorado 8yo, 12yo, 15yo and 25yo. The single wooden pot still – Was first in Versailles, then moved to Enmore, then via Uitvlught to Diamond. This still which is over 150 years old also produces a heavy bodied rum but more refined and very flavorful and deeply aromatic. Used in the 15yo and 21yo. The single barrels from El Dorado are different from the blended ones and are very different from the more “mainstream” blended rums. The original French Savalle still – Is from the 18th century and is a four column metal from the Uitvlught sugar estate. Rums from the original Savalle is used in the El Dorado blends and their ICBU marked Single Barrel Rum. The modern version of this still produces 9 completely different types of rums. All from very light to heavy bodied rums. There´s much discussions as to whether or not and how much the wooden stills helps to impart the unique flavor characteristics of the demerara rums. Let`s say that these old stills definitely adds to the flavors – but of course not alone. And I don`t think you can directly associate flavors with stills – rather then with a type of rum – like pot still = heavier more flavorful rums and column stills = lighter rums – but these old stills really are one of a kind and what they add to the flavor boquets of these rums I believe is unique in the world. – Unique environmental properties like microflora, soil and atmosphere of the Guyana coastlands which lends to the production of flavors and aroma. – These flavors and aromas are in turn heavily affected by fermentation, distillation, aging and blending. – The old wooden stills adds to the flavor boquet of these rums creating a rum that is unique in the world. – did i forget anything? if i did please add in the comments of this post. This is something that many are wondering about – how do they manage to maintain these old wooden stills? Well, first of all – the wood isn`t actually all the same wood as the stills were initially built with – the wood is kind of ‘worn out’ every time you distill in it, that`s the course of nature. The wood both soaks up some of what is being distilled in it and gives back flavors & complexity to what is being distilled. So they change the wood in small sections so there is always some newer wood and always some older wood in the still to retain the flavors. Each section is changed every 15-20 years or so and once they finish all the sections they just start again at the other end. Done this way the stills lasts very very long..how long they will last i don´t know – but I hope they will not finish anytime soon, which I believe they won`t. In the last century, the remaining Guyanese distilleries were consolidated by Demerara Distillers Limited on the site of the Diamond Plantation, and today operates as the sole rum producer in Guyana. With a production capacity of more than 26M liters of pure alcohol annually, DDL sell bulk rum to a number of international blenders and bottlers and bottles rum under their own El Dorado and other labels. The rums from El Dorado are famous in the world but for those who wants to explore more demeraras there are private labels to try out as well, the problem is that these are often hard to get and are often extremely expensive. I have tried a few of these privately bottled demeraras from for example Silver Seal, Velier and Samaroli as well as blends from the DDL bearing the name of the still and the year of bottling. These are fantastic examples of demerara rums where most of them but not all, (Velier rums are for the most part as far as I know tropical aged) are aged and then bottled in Scotland by for example the Silver Seal Company (which is based in Italy). One of the incredibly beautiful bottlings from the Silver Seal. These private bottlings I believe are mainly for serious rum enthusiasts and collectors and they have a solid following especially in Europe naturally since that`s where they are for the most part available but for most others El Dorado is the most known brand since it can be bought in most places and to easier prices than the private bottlings. I like the high proof demeraras from the private bottlers the most though, because a bit higher proof gives so much more flavor bite! and also because most or most all of those are pure rums straight from the cask with nothing added. But for those who`s interested and can get hold of these rums you may want to read different reviews of them before purchasing an expensive bottle and some can be found on blogs like the Loner Caner or Whiskyfun . Some of the labels, especially from the Silver Seal company are stunningly beautiful and to show you the details I enclose a picture here from the Wild Life series which shows exotic birds in the jungle. All I can say is that I wish I could paint like that. I for one wouldn`t mind a deep dark very heavy bodied highproof rum from El Dorado either…available to all and decently priced. I mean – the more rums the better! (Update – such rums does now exist in the three releases of the El Dorado Rare Collection) These are three cask strength (not single casks!) expressions from the three heritage stills, the Enmore ‘EHP’ wooden Coffey still, the Port Mourant ‘PM’ double wooden pot still and the Versailles ‘VSG’ single wooden pot still. 3,000 bottles of each have been released globally. I have tried them and I found them to my liking. Unfortunately they are very expensive. Swizzle with plenty of crushed ice and pour into a glass rimmed with dark demerara sugar and garnish with fresh mint. For your Demerara rum cocktail pleasure, enjoy! I believe many people more and more want rums with some “ompf” and attitude – correct me if i`m wrong. Any rum that is refered to as Demerara rum must be distilled in Guyana in the county of Demerara. Thanks to the DDL and to the (former) El Dorado Rum Ambassador Stephanie Holt for pictures of the stills.